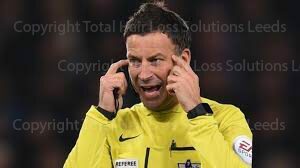 Mark Clattenburg, premiership referee’s hair system that was originally designed by Sat Phull, who is now the director of Total Hair Loss Solutions Leeds, West Yorkshire, will be on show in the UEFA Euro 2016 Finals. A few years ago this referee was withdrawn from the Charity Shield, he had been dropped from all refereeing duties for 8 months pending enquiries into reports of the official’s alleged debts but appealed against his sacking successfully. So this will be his first major Euro Finals and people who are experiencing hair loss in Leeds, West Yorkshire will be looking closely at his hair. Many footballers and other sporting personalities are keen to maintain their hair just like many of us. Rooney has captured the attention of many as his hair transplant results are excellent and many hair loss sufferers have been encouraged to pick up the phone and enquire about what options are available. Total Hair Loss Solutions are fully aware of the fact that most professional footballers earn huge amounts of money, therefore they can afford to spend a lot of money on various treatments. Hair Loss Treatments are not only for wealthy people, we will make sure of that. Our prices are not determined by what you earn or what you do for a living, they are very affordable and that is the feedback we have had from our very happy clients. There is no need to suffer from hair loss or thinning hair anymore, put an end to baldness.